Pure Essentials is a full service water treatment company offering installations and maintenance of all of our water treatment equipment for your convenience. All of our services are optional, but very affordable and highly recommended. Our annual maintenance plan extends the warranty on your equipment indefinitely. However, this equipment is easily serviced by the owner, should you choose to do so. We offer one call technical support and free product retests should you ever have a concern with your equipment. Pure Essentials is fully licensed and insured. Do you have concerns with your current water supply? Are you noticing bad tastes, odors or discoloration? Or are you just not sure what is in your water? Pure Essentials offers a Free Water Quality Evaluation to help answer your questions and discuss the concerns you are having with your water. In less than 1 hour we can finish our tests, discuss the results and help answer any questions you may have about the results. We run these tests in effort to help educate our community about water quality and to spread the word about what we do here at Pure Essentials to try to help people solve their water quality problems. There is never any cost or obligation to speak with us. We encourage everyone to learn more about their own water quality and are happy to help you do so. If you would like to have your water tested and/or speak to a company representative in person, please do not hesitate to contact us for scheduling. 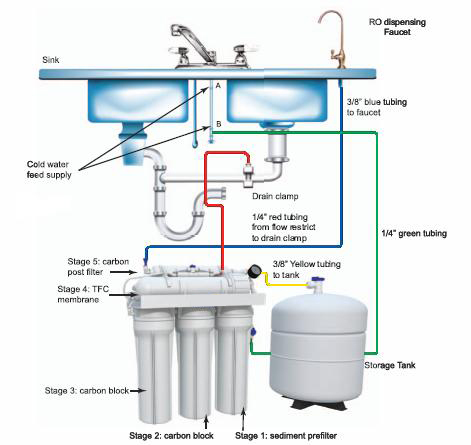 Pure Essentials offers affordable installation of all of our water treatment equipment. Should you decide that our equipment is right for you, we will plan your installation and incorporate the cost into one finalized quote with no hidden fees. Installation time can vary depending on the magnitude of the installation and one of our qualified representatives can quote you an accurate time frame during your free consultation. We always coordinate your installation appointment around your schedule for your convenience. Most types of water treatment equipment, including reverse osmosis, require a regularly scheduled maintenance to ensure they are functioning at optimal efficiency. We offer an optional annual service plan to all of our customers. A standard annual maintenance would include changing the three pre-filters and the post filter of the RO system, sanitizing the housings and holding tank, and retesting the product water after maintenance to ensure the highest possible quality. There is never an obligation to allow Pure Essentials to maintain your equipment should you decide to do it yourself. However, maintaining your equipment on your own can void your warranty. We encourage you to allow the water quality professionals at Pure Essentials to maintain your system. Should you allow us to maintain it for you as we suggest, your equipment will stay under warranty. We will also replace any additional stages on a customized system that also require annual maintenance. Maintenance costs can vary depending on equipment and location. A qualified Pure Essentials representative can quote you an annual service cost during your FREE, no obligation consultation.